Berry: I’d have booed myself too! Town midfielder Luke Berry was quick to shrug off the abuse he received at former club Cambridge on Saturday, admitting he would have probably booed himself too! The 25-year-old was making his first return to the Abbey Stadium since a move to Luton back in August. If I was a Cambridge fan I’d probably boo me, so it’s just the way it is. He was taunted mercilessly throughout the game by supporters who had idolised him last term, when he swept the board at the U’s end of season awards ceremony. The treatment came as no shock to Berry though, as he said: “I didn’t expect anything else, I just took it in my stride and was just disappointed to not get the win. “I’ve been here since I was a kid, it’s just one of those things, I don’t expect anything different. “If I was a Cambridge fan I’d probably boo me, so it’s just the way it is. “I know how it is, I’m not going to sugarcoat it. They’re going to boo me, if they want to boo me they boo me, it’s not going to bother me. 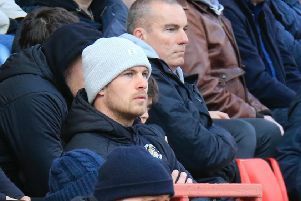 Boss Nathan Jones felt that the United fans had short memories of just what a servant Berry had been for the club, scoring over 50 goals and playing almost 250 games during his two spells with the U’s. He said: “It’s expected, but I just think they forget how good a player he was for them. “I thought he handled it fantastically well in terms of his pressing, he was excellent and you know the type of player he is. “He’s been brilliant for us and he had a good temperament about him. Although every touch by Berry was met with jeers from the home supporters, he produced a sterling display throughout and felt the reception he got actually spurred him on. “It’s one of those things, if you hide out there it’s not the way to be. Although the game had been under threat from the ‘Beast from the East’ which decimated the football programme up and down the country, Berry didn’t think it had affected Town’s preparation for the fixture in any way. He added: “We trained like normal, we were out in the snow, obviously it was a bit chilly, but we did everything right.